Dorothy Doring is veteran vocalist who can take any jazz, pop or cabaret tune and turn it into something divine, and convince you through her ability to story tell that she is delivering the defining version and it will be her rendition that will stand as the timeless arrangement all others will compare their version to. 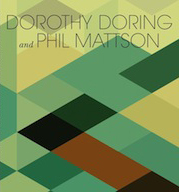 With her latest endeavor, Compositions by Duke Ellington and Billy Strayhorn, Doring takes the listener on a journey of piano and voice, with the fine skills of Phil Mattson on piano, it is a gathering of two equally seasoned veterans. I found myself recalling the timeless recording Ella and Oscar. What better way to make your case as a vocalist, but through the intimate setting of piano and voice. stripped down sound that lends itself to the true performance, and Doring is on fire – this could be the soundtrack to the wind down of the day or the background while working the day away; or the moments when it’s just about you and your earphones and connecting to the music. No matter the setting, Dorothy Doring and Phil Mattson create a true offering of persuasive performances. Highly recommended!! Track Listing: Day Dream; Everything But You; Something To Live For; Love You Madly; I Got It Bad And That Ain’t Good; In A Mellow Tone; Lush Life; I’m Just A Lucky So And So; I Didn’t Know About You; I Let A Song Go Out Of My Heart; Heaven.